Topic category: Elections - Politics, Polling, etc. Despite polls proclaiming Hillary Clinton has the Labor Day lead, the real picture tells a different story. You can see how desperate the "usual suspects" are to "show" Hillary leading on Labor Day by noting the number of stories about how Clinton leads Trump today. These stories inevitably relate Clinton's "lead" to past election leaders on Labor Day, most of them going on to win in November. But this is no ordinary election. 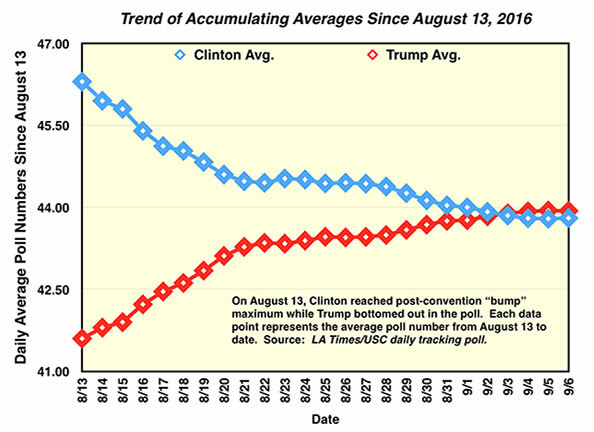 Consider that for the eighth consecutive day the LA Times/USC daily tracking poll has Trump leading Clinton while the long-term trend since August 13 (the zenith of Hillary's post-convention "bump") has Trump's long-term average leading Clinton's on Labor Day for the first time since August 13 and with a strong impulse to continue to widen that lead. The significance of this chart is Trump's steady rise in the "to date" average since Clinton's post-convention maximum while Clinton's numbers have steadily declined or remained about the same. Of particular interest is that on Labor Day, the first real "benchmark" of how candidates are doing, Trump's long term average exceeded Clinton's for the first time since Clinton's maximum post-convention bump. Because each new date is based on a larger sample, the trends carry more weight (and momentum) as time marches on toward election day. The strong trend of Trump rising and Clinton falling will be difficult to reverse. Barring some substantial change in the race dynamics, Trump's superior poll numbers should steadily increase his margin over Clinton. The same LA Times/USC poll provides background demographic figures that further suggest Trump is strongly positioned to win in November. Trump’s margin among male voters is 23.2%. Clinton’s margin among female voters is just 8.9%. Trump’s margin among White voters is 23.3%. White voters are the largest voter demographic, by far. Trump’s margin among non-Black, non-Hispanic, non-White voters is 1%, a virtual dead heat. Trump’s margin among lowest educated (HS or less) voters is 23%. Trump’s margin among middle-educated voters (some college, no degree) is 8.3%. Trump’s margin among middle-aged voters (35-64) is 1.6%. Clinton’s margin among youngest voters is just 3.9%. Trump’s margin among oldest voters (65+) is 9.3% (listen to your elders, children). As these numbers reveal, Trump leads substantially in motivated demographic profiles and those most-likely to vote this November. Apparently, the Hillary “lead” on Labor Day is just the "usual suspects'" latest pro-Hillary narrative. Bob Webster, a descendant of Daniel Webster's father, Revolutionary War patriot Ebenezer Webster, has always had a strong interest in early American history, our Constitution, U.S. politics, and law. Politically he is a constitutional republican with objectivist and libertarian roots. He has faith in the ultimate triumph of truth and reason over deception and emotion. He is a strong believer in our Constitution as written and views the abandonment of constitutional restraint by the regressive Progressive movement as a great danger to our Republic. His favorite novel is Atlas Shrugged by Ayn Rand and believes it should be required reading for all high school students so they can appreciate the cost of tolerating the growth of unconstitutional crushingly powerful central government. He strongly believes, as our Constitution enshrines, that the interests of the individual should be held superior to the interests of the state. A lifelong interest in meteorology and climatology spurred his strong interest in science. Bob earned his degree in Mathematics at Virginia Tech, graduating in 1964. Read other commentaries by Bob Webster.